The chicken tagine, a traditional Moroccan stew, is well-seasoned and moist, served with preserved lemon, green peas and whole green olives. The makouda, or potato croquettes, seasoned with garlic, cumin and cilantro are staggeringly, melt-in-your-mouth good. The room on the right as you enter is especially inviting with an orange and red color scheme, interior curtains and an elaborately upholstered banquette. Marrakesh Restaurant's orange curtains and terra cotta-colored awning brighten the restaurant’s exterior considerably. Just from outward appearances, Marrakesh Restaurant’s orange curtains and new awning are a welcome change from Shish Cafe’s ever-streaked full length windows that greeted customers. Shish, a long-standing Mediterranean restaurant with Syrian roots on University Avenue, closed last summer, directing customers to its more contemporary sister restaurant, Palmyra. Then that place, in nearby Middleton Hills, abruptly closed in October. Marrakesh, which opened Feb. 1, should have a built-in clientele since the Moroccan restaurant serves similar Middle Eastern cuisine, and Shish had many loyal customers. Inside, owner Youssef Amraoui has also made improvements. The room on the right is especially inviting with an orange and red color scheme, interior curtains and an elaborately upholstered banquette that is more beautiful than comfortable. (It helps to prop yourself up with pillows). The food also surpasses its predecessor. On a recent Saturday night, it was nothing short of sensational. The restaurant was busy but not full, with Amraoui later telling us it was a particularly good night for him. It was a great night for us, due, in part, to an unfailingly sweet and helpful waitress and spectacular food. Both appetizers were knock-outs, particularly the makouda ($6.50), lightly fried, puffy potato croquettes with bits of carrot, seasoned with garlic, cumin and cilantro. These were staggeringly, melt-in-your-mouth good. The zaaluk ($6) was a rich tomato spread or a dip made with eggplant, roasted green pepper, olive oil, garlic, cilantro and other spices. It would have stood out as a highlight of the meal if not for another dish that was misleadingly listed under salads. The mohamara ($7), better categorized as an appetizer, was also a dip or a spread, best eaten with pieces of pita bread. It was an astonishingly delicious and slightly sweet blend of ground walnuts, roasted red pepper puree and spices. Artichoke hearts were also listed as a main ingredient, but they were apparently blended in so well as to be undetectable. A good amount of time went by between our appetizers and main course. Finally Amraoui came to our table apologizing for the wait and offering two cups of the restaurant’s phenomenal harira ($2.50), a traditional Moroccan tomato-based soup thick with chickpeas, lentils, rice, celery, cilantro and other spices. Our waitress would later also offer up delicious sweet Moroccan mint tea ($3) for the inconvenience. She explained that one of our entrees, the seafood bastilla ($17) came out of the oven overcooked and had to be redone. But the finished product was worth waiting for: small shrimp, calamari and scallops tangled in vermicelli rice noodles encased in phyllo dough. It came with a wonderful cup of yogurt sauce that must have had a touch of sour cream because it was richer than most. We also used it with our other entree, the chicken tagine ($14). The chicken, meanwhile, was well-seasoned and nearly falling-off-the-bone tender, served with preserved lemon, green peas and whole green olives. 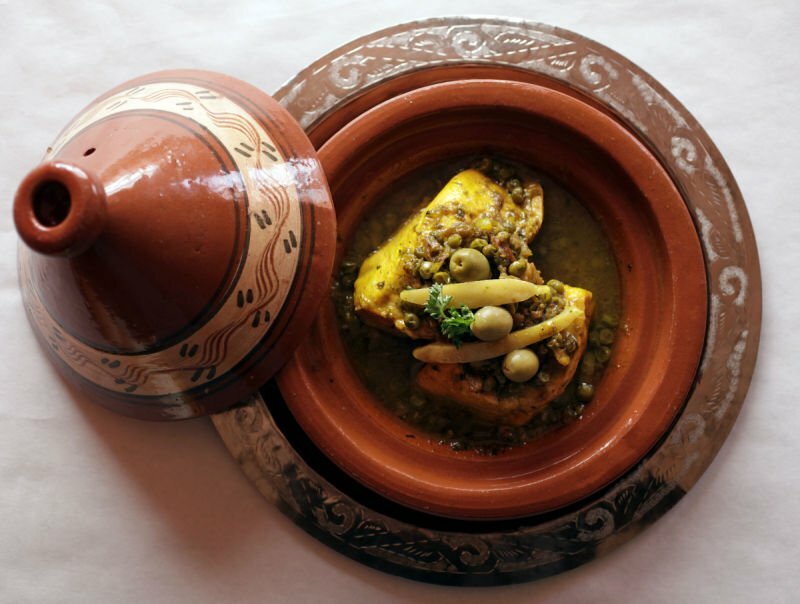 The signature Moroccan stew came in a handsome tagine, an earthenware pot with a cone-shaped lid. The yellow rice on the side infused with saffron was a real treat. For dessert, our server recommended the Moroccan delight ($4), described as almond cookies but tasting more of jasmine. All three were different but equally attractive and made by Amraoui’s wife, Hagiba Fares, who is a pastry chef. Aside from the long wait for our entrees, which Amraoui thoughtfully remedied, there was not a false note in the meal. Fans of the Shish will definitely be delighted. Hours: Tuesday, Wednesday, Thursday and Sunday 11 a.m. to 2:30 p.m. and 5 p.m. to 9 p.m.; Friday 11 a.m. to 2:30 p.m. and 5 p.m. to 10 p.m.; Saturday 11 a.m. to 10 p.m.
Bottom line: Some of the best Mediterranean cuisine available in Madison, or anywhere for that matter. Don’t miss the mohamara, deceptively categorized as a salad. It’s an ingenious combination of pureed roasted red peppers, artichoke hearts, ground walnuts and spices. 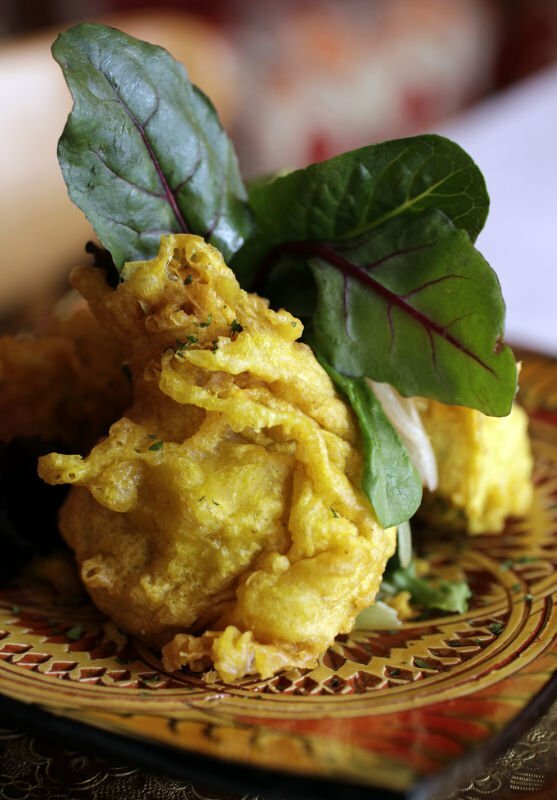 Marrakesh has plenty of offerings for vegetarians.